An IVR system can drastically lower costs and increase customer satisfaction. But, this is only the case if you choose an IVR that is well-suited to your business’s unique needs. An IVR is a telephony menu system that allows segmentation and routing of callers to the most appropriate agents within your team. By recording customized welcome greetings you can provide a more personalized experience to your customers when they call on your business number. Interactive voice response system (IVR) is a system where the clients call is received by the pre-recorded message. This message helps the caller to reach to a solution for the problem. The caller has to press the desired number which related to their problem as they hear the recording. If the problem is not solved through the IVR it is transferred to the company agent. How our IVR Benefits your business? 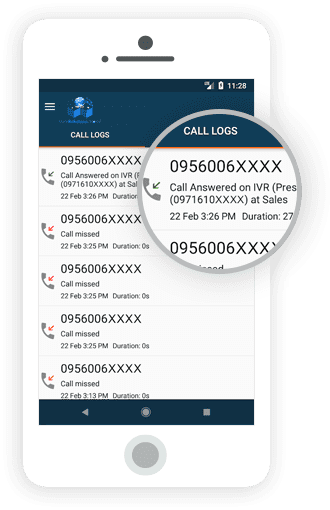 Smartly connect every caller to the right department – quickly and effortlessly. Help callers choose from multiple languages. Make it easy for your callers. Automatically record the calls for better monitoring and quality maintenance. Reduce the chances of missing on calls with instant SMS and email notifications. Real-time reports available on a simplistic dashboard for data-driven decision making. Maintain a high level of utilization and cost efficiency when it comes to your contact centre. Can the IVR system be integrated with other software and hardware applications? Which types of customer interactions can the IVR system handle? Is the IVR system easy to modify over time? How will customers navigate the IVR system? Can I try the IVR system before I buy it? WebPreneurs Pvt Ltd is the fastest growing cloud telephony company, providing IVR service in Noida, Delhi NCR and across India. An Interactive Voice Response (IVR) which is simple, can process over a million calls an hour, usable, voice-driven IVR platform. All you need to do is get in touch with us at the dedicated number for your country, and we’ll connect you to the right people! We have dedicated teams to serve you.